Barrier, Michael (1999). Hollywood Cartoons: American Animation in Its Golden Age. Oxford: Oxford University Press. ISBN 0-19-503759-6. Maltin, Leonard (180, updated 1987). Of Mice and Magic: A History of American Animated Cartoons. New York: Penguin Books. ISBN 0-452-25993-2. ^ Deitch, Gene. 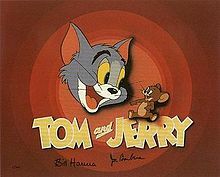 Tom & Jerry: The First Reincarnation. Animation World Network. 2001 [2009-09-27]. （原始内容存档于2009-12-26）.